I finally found some time to put together a little tutorial on one way to embellish a naked shade. I've seen others around blogland and all have been fabulous. You really can't mess these up. Start by removing the fabric from your shade. I always seem to find perfect candidates at Goodwill for only a couple of dollars or less. Then I used whatever I had laying around my studio. These fabric doilies work great because you can lace them on with cotton string or jute. 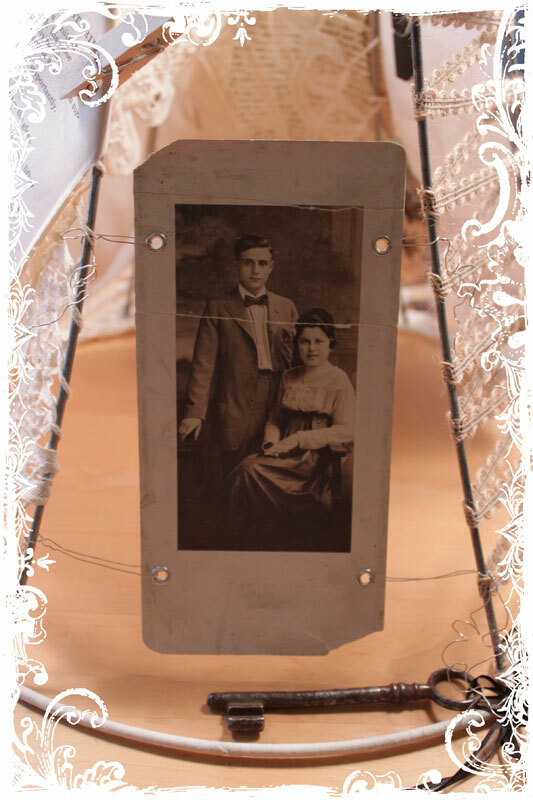 Attach an old cabinet card in another. I used grommets and fine gauge silver wire. 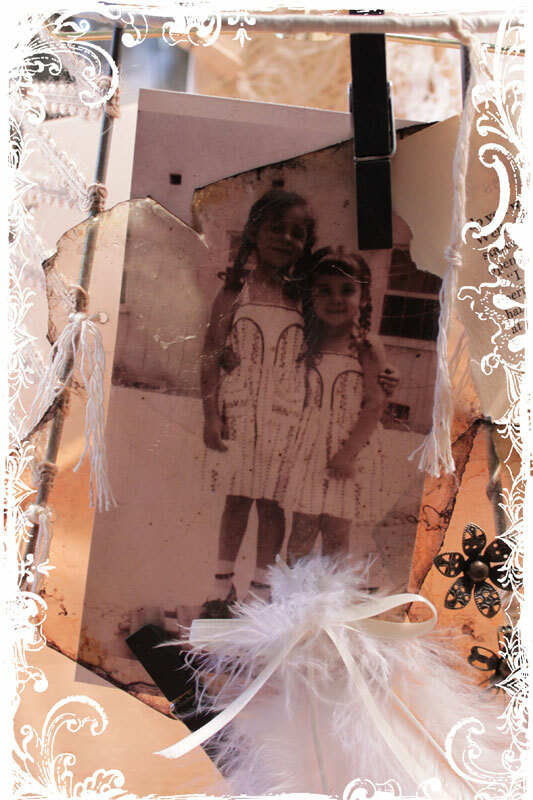 If you don't have an actually cabinet card, print out an old photo and apply to a piece of watercolor paper. It's got a nice thickness and is acid free. 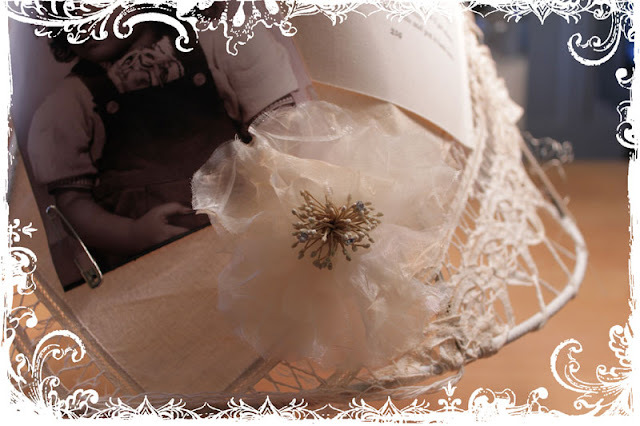 Clip on flowers or bows, and pin copies of old photos to the fabric doily. 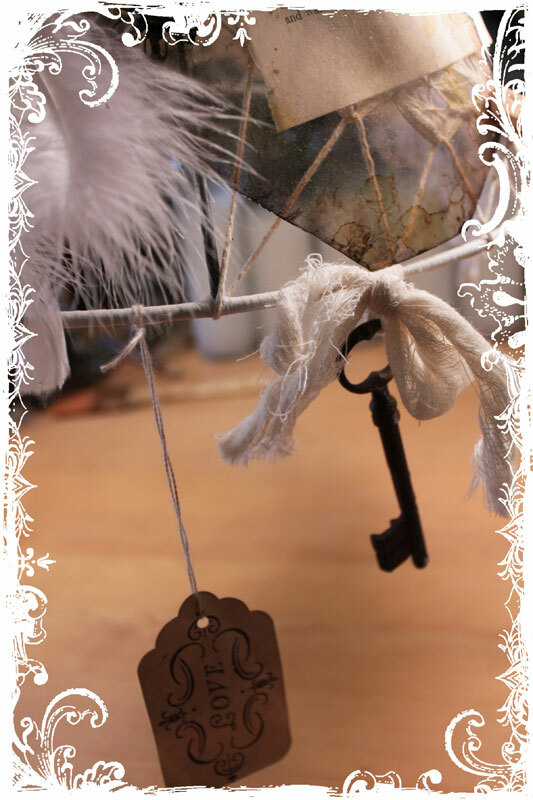 Hang old keys, tags, crystals, silver spoons... any thing works really. To finish it off I added this great clock face to the finial since the lamp sits low enough for me to see the top. I also added a few book pages to areas where there was too much direct light from the bulb showing through. This was a really fun and easy project. I hope you will share with me your creation if you decide to make one! One last thing. I failed to mention a wonderful Giveaway from Rebecca for Vintage Living She has made this Gorgeous necklace to celebrate 200 followers!!! I'm crossing my fingers on this one too!!!! Go see her and tell her Karen sent you! Karen, thanks so much for the tutorial, I've been wondering where to begin!. I like how you have laced things and wired things, etc. The white floral tape will make it nicer, for sure! I'll try it soon! Thank you, Karen! That floral tape may be just what I need! Great tutorial and I love how yours turned out. OMGosh!! Your lampshade is sooo pretty! I love all the fun elements you brought together on it. Beautiful!! Thanks so much for the nice post on my give away, you are such a sweetie. Thanks for all the great ideals. Absolutely gorgeous!!! That is just the most creative lampshade and I can only imagine how beautiful it must be when the light is on, filtering all the assorted pieces through. How beautiful it must be. I love it all. What a fabulous job you have done. I just thank you so much for sharing with me. I will be on the look out for lampshades now. How exciting, even ones at the street for trash are no salvageable. Wow, your lampshade is sooooo pretty! Thank you for a fab tutorial! I want to make one now!! Oh Karen, my dearest desert friend! Where do you find mica? Never seen in Italy, maybe in some antique market, mounted on old lamps or lanterns. I loved Lisa's blog (if Karen loves it ;D ...) and I'll follow it. WOW!!! Your lampshade is totally awesome. Now this might just push me over the edge to make one. I have collected a few shades and just love how you did yours. And the clock face at the top...great finish! Fantastic...you know I loved the shade...I will have to look for one of those shades. My GW by me is not very good....but the one in Surprise, is better. How beautiful, and so simple. Thanks for showing us. Thank you so much for the wonderful tutorial!!! 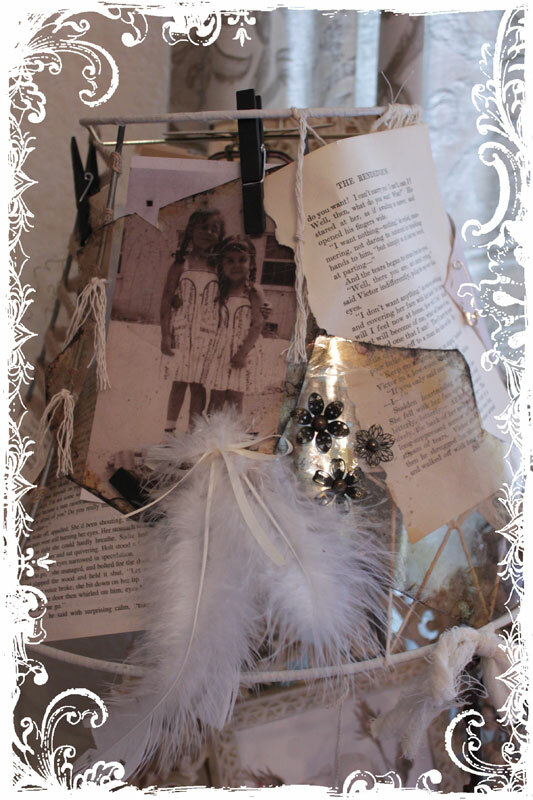 I'm going Thursday to buy all the materials to make the lampshades. I have been making a lot of lamp shades lately too! I always seem to be so busy these days. I like when blog friends visit, so I can visit back. Wonderful! Thank you so much for sharing. I think that I have the perfect lamp shade for this one. I'll have to give it a try. I have been in the creating mood lately. That's beautiful! 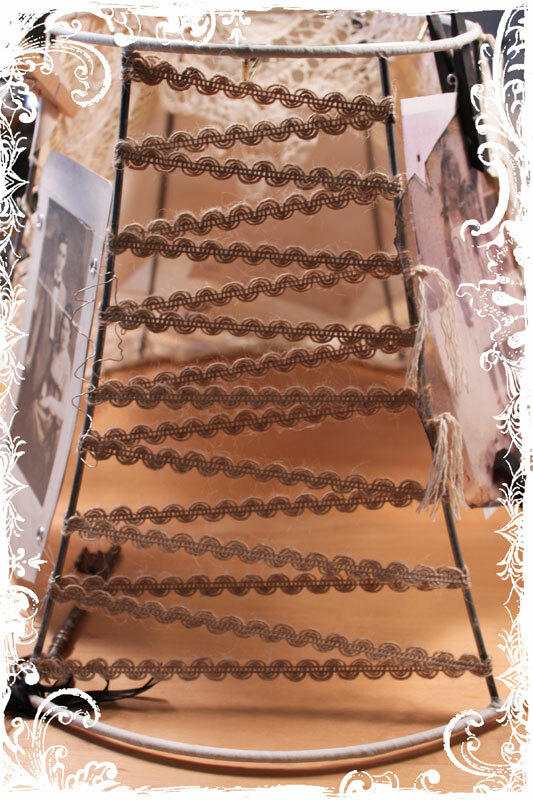 I love how you used the lace doilie. I just did an itty bitty how-to with some paper doilies. What a neat project. 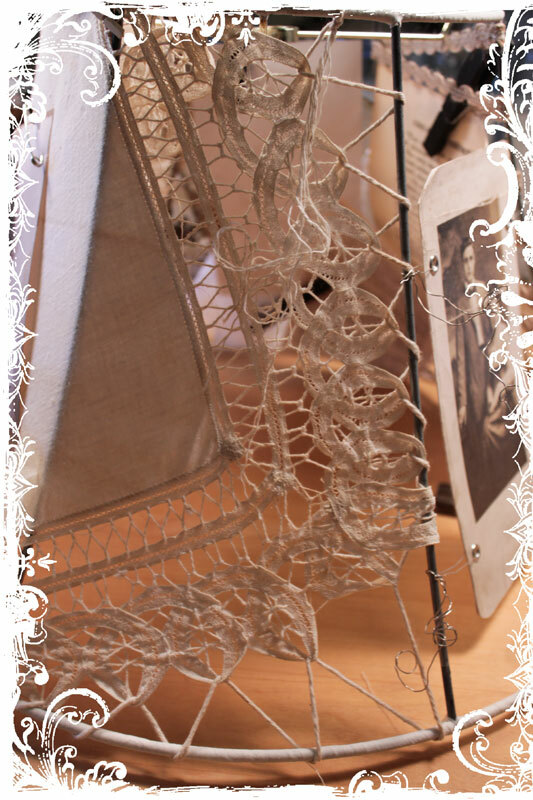 I like how you did the 'weaving' with doilies to attach them and other embellishments. This is a cute shade. Thanks for sharing yours! 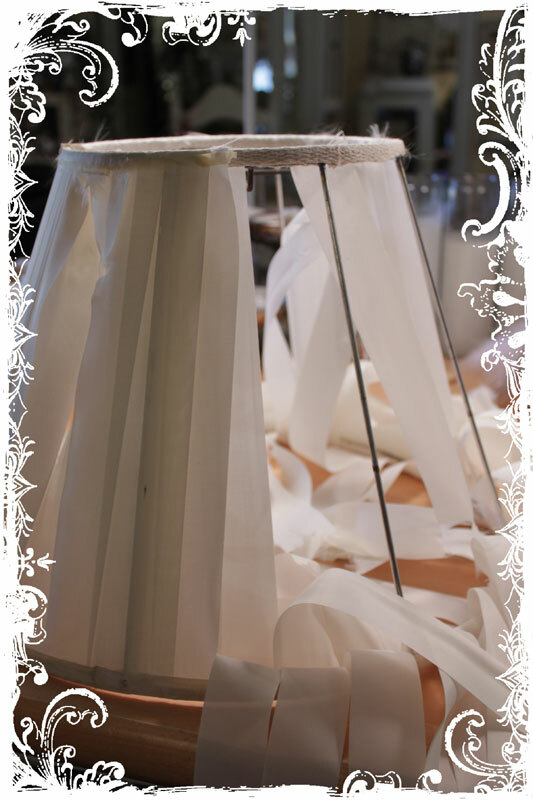 You can create a lamp shade and make it Brighter and Beautiful. thank you so much for this, karen:) it's wonderful! I saw this and got right up and shredded a lampshade. You are right about the sticky bits, so I took it on the back porch and sprayed it with a bit of paint. 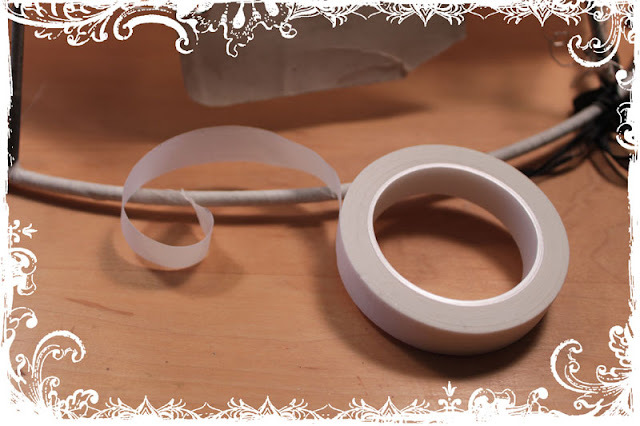 Now I am wrapping some vintage trim around the wire. A work in progress, but you totally inspired me, thanks girl! Thank you for the inspiration! I found you only recently on Pintersst. I made a lampshade this weekend & absolutely love it! I used trinkets & postcards my dad sent to my mother when he was in Marseilles, France during WWII. I get to see these beautiful memories every day. The lampshade is the perfect way to display them. Thanks, again! I've just recently found you through Pinterest. I must thank you for the inspiration I took from your lampshade! I made one this weekend & I absolutely adore it! I used mementos my father collected while he was in Marseilles, France & other places during WWII along with some trinkets & postcards he sent my mother during those times. Seeing my lampshade every morning & night next to my bedside is wonderful! It's such a unique way to showcase these priceless memories. 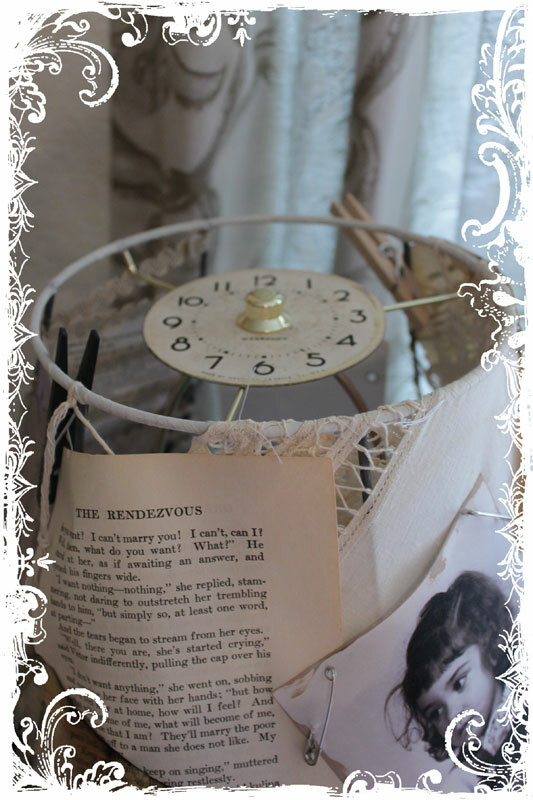 Oh, I used a vintage light bulb which makes the lampshade even more adorable times a thousand! Thanks, again!